You can use Search It, the library's universal search system, to find journal articles. 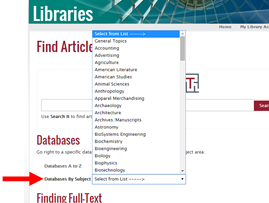 To find journal articles, do a search in Search It as you normally would (libraries.wsu.edu). Then, on the left side, refine your results by clicking on "Peer-Reviewed Journals" under "Limit my Results," or click on "Articles" or "Newspaper Articles" under "Type." If you are searching directly in a database (see the box in the upper right corner), you can access the full-text of the article by clicking on either the HTML Full Text or PDF Full Text Link. Some records will have one or both of these links. If the result you want does not have the link, you can click on the "Find It @ WSU" button. This will bring you back to the record in Search It and will lead you to a database that DOES have the full text. If there are no databases, you can order a scanned copy of the article through Interlibrary Loan. This service is FREE to students. For instructions on this, please see the box to the right. SearchIt does not pick up every article in every available database. Sometimes, you need to go straight into the database itself. You can search general, interdisciplinary databases, or you can search in subject-specific databases (which will greatly narrow your results). While you cannot use Interlibrary Loan to order books while you are studying abroad, you CAN use it to receive electronically-scanned articles directly in your email. This service is FREE! 1) From the library homepage (libraries.wsu.edu), select "Interlibrary Loans" under "Services." 2) Buried in the text, in "Requesting a loan," select "Illiad login page." 3) You will be prompted to login using your WSU Network ID (firstname.lastname) and password. If this is your first time, it will ask you to create an ILLiad account. You will then be able to login and make requests. 4) After you have logged in, you can request an electronic article by selecting "Copy" under "New Request." This is on the left side of your screen. Fill in as much information as possible, but at least the information that has a red asterisk. * You can ALSO request scanned copies of book chapters, conference papers, and theses/dissertations if these are available.